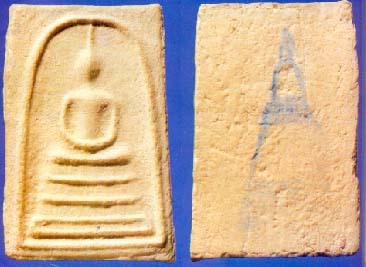 In BE2509, when Wat Bahng Khun Prom held a major celebration to build a large statue of Buddha and Pra Somdej Puttajahn (Toh Promarangsee), there was also a batch of somdej amulets of mixed powder being chanted. It is called mixed powder somdej because the amulets were mixed with many different types of amulets from old chedi all over thailand; old somdej amulets from Chedi of Wat Bahng Khun Prom, amulets from Chedi of Wat Sahm Pheaum, amulets from Chedi of Wat Kroosalort, Ayutayah, Pra Nang Phayah amulets from Chedi of Pitsanulohk and even first batch of Wat Paknam amulets. Mainly, this batch of somdej amulets was chanted for the purpose of replacing the broken old somdej amulets from the old chedi of Wat Bahng Khun Prom. (The old chedi was opened in BE2500 and all the somdej amulets that were placed there by Pra Somdej Puttajahn Toh, a hundred of years ago were removed from the chedi to prevent further damage to the chedi and theft on the old somdej amulets) Half of the newly chanted somdej amulets would be placed inside the repaired chedi and the other half would be distributed to the public. As such, this batch of somdej amulets is also called Pra Somdej 09, meaning somdej amulets chanted in BE2509. In addition, there were 3 more pims, but there were no records of how many pieces were chanted. They are, Pim Get Bua Dtum, Pim Roop Meuan Somdej Puttajahn Toh Hah Leam and Pim Roop Meuan Somdej Puttajahn Toh See Leam. One important thing to note about this batch of somdej amulets, is that every pieces of amulets are different and not the same in terms of clarity and sizes, this is because this batch of amulets were hand made. Due to the mixtures of many types of powders, the colour of the amulets also varies from one another, some are more white, so more yellowish and some even can see old somdej powder. In regards, to the temple chop at the back of the amulet, some amulets has a clearer chop, some lighter, some darker and some without chop. Pra Somdej Bahng Khun Prom Roon 09 is as good as the old somdej Bahng Khun Prom chanted by Pra PuttaJahn Toh, this is because it contained the old somdej powder. Not only it was chanted by many famous and good monks, it was chanted for a good purpose as well. Good for metta mahaniyom (loving kindness), Kong Grapan (invulnerable against weapons), Klaew Klah (protection) etc. Eventually, the use of this amulet depends on the wearer himself. The prices for Somdej Bahng Khun Prom range from a few thousands bahts to a few hundreds of thousands bahts depending on Pims and condition.